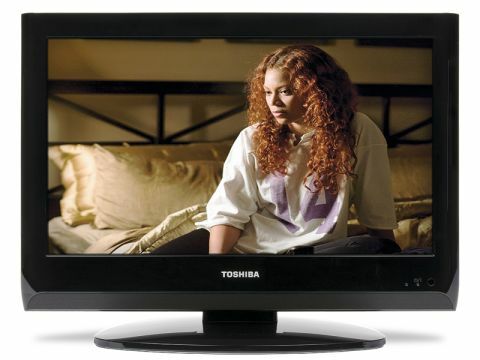 Despite the 19AV615DB's budget status, this pint-size TV sports a gloss black bezel and is also available in white. A svelte profile is combined with a compact stand for the smallest footprint possible, while the speaker grille is neatly tucked away under the screen. Setup took a little longer than we expected, as the channel scan screen did not appear automatically and we had to search through the onscreen menus to find it. On the plus side, the menus are colourful, clearly laid out and easy to navigate. However, they can be sluggish to activate and sometimes a few clicks of the remote's buttons were needed to get a response. Freeview images look a touch soft, but that's standard, given the usual quality of the broadcasts. DVDs offer massively clearer pictures and more vibrant colours. There is a 'flesh tone' setting to enhance natural hues, but this was best left turned off to avoid overly orange skin tones. Images are further improved with the introduction of an HD feed, but the occasionally visible backlight and patchy black repro are a slight letdown. The remote control is light and comfortable to use with clearly labelled buttons. On the standard setting, the audio sounds weak, but then they are small speakers. Switching to the 'surround sound' setting opens up the sonics and works really well on film soundtracks, although it's not a patch on a genuine surround speaker system.